Commuting to Humber is easy! With nearly 80,000 full and part-time students travelling to and from campus on a regular basis, transportation management is a major focus at Humber. We actively support energy-efficient forms of transportation, such as public transit, bicycle commuting and carpooling. By managing transportation demand; reducing traffic congestion; and enhancing campus security, we are steadily improving our environmental outcomes and making our campus cleaner and safer for the Humber community. In February 2016 we conducted a follow up Sustainable Transportation Study. We had 3,794 students and 711 staff and faculty respond! The results can be found here. In October 2013 we conducted a Sustainable Transportation Study. We had 3,780 students and 631 staff and faculty respond! The results can be found here. We are working with Smart Commute to improve sustainable transportation for the Humber Community. Humber is actively involved in strategic planning with Metrolinx to bring a Light Rail Transit (LRT) system to campus in the near future. 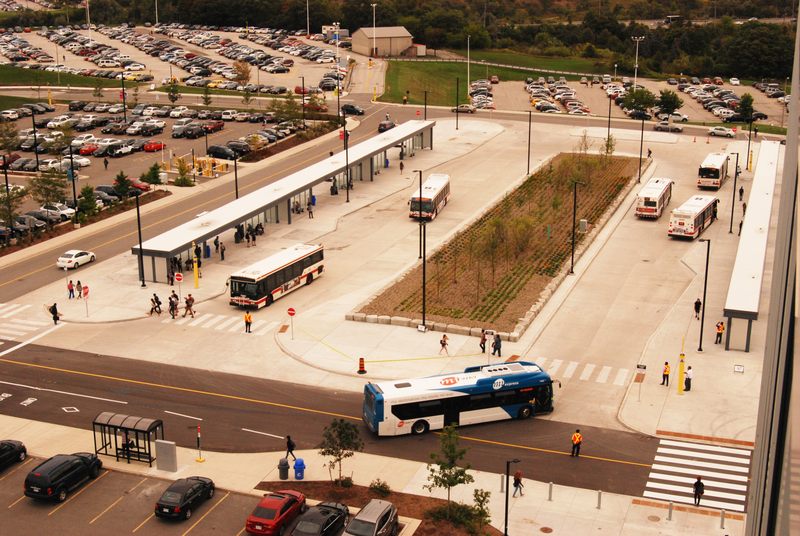 The new bus loop at the North campus sees over 1,200 buses each day. The bus loop has improved the transportation network and created more space for pedestrian walkways. In September 2017, we brought Dropbike, a Canadian bike share program to campus.